While made to hold a dazzling array of fun CHARM IT! 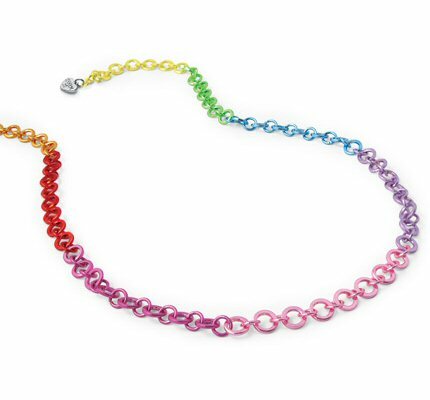 charms, this colorful Rainbow Chain Charm Necklace even looks good all by itself! Bursting with fun and fashion, this chain necklace circles the world of color - yellow, green, blue, purple, pink, magenta, red, and orange. And once you attach your favorite CHARM IT! charms (with the simple snap of a clasp), it is all the more fabulous as you display your own unique personality and then change it up whenever the urge strikes to match any mood or outfit. A colorful body and white wings covered in a rainbow of colorful hearts makes this Rainbow Dragonfly charm a beauty! Enjoy milk and cookies without the calories with this fun 3-dimensional CHARM IT! Milk & Cookies charm.